Dog house is important for dog as you think house is important for people. For some people, they just keep their dog inside the house, then let it sleep in the corner or anywhere as long as both parties (owner and dog) feel comfortable. But, do you ever consider if your best pal sometimes need privacy too? A time where he can spend all day long laying inside the house without any disturbance from, let’s say, your baby boy. 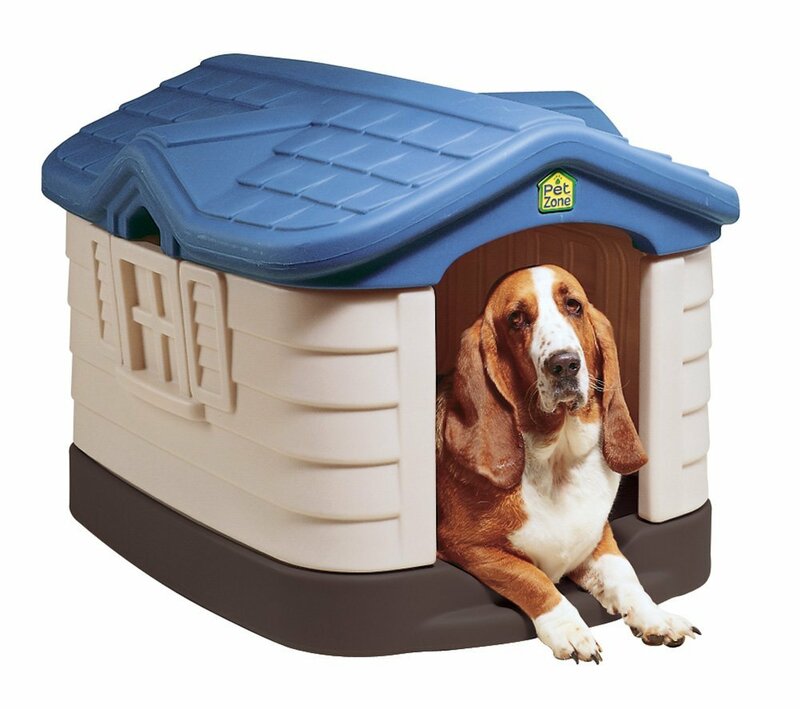 Also, dog house somehow can give safe feeling to your dog. Here, I am focusing in indoor dog house, because I like to know every movement from my puppy. I can have some controls too with this kind of dog house. How to Choose the Right Dog House? Choosing the right dog house is the first thing you should know. All of us want it to feel safe and comfortable inside its house, right? That’s our main point from the beginning. Besides, I would like to have a great look dog house and a functional one. The materials of the dog houses usually are wood, metal, and plastic. Each material has its own characteristics. Wooden one is my favorite, because it gives warmth feeling and looks luxurious. However, if your dog is chewer one, maybe it’s not a best choice. Plastic material dog house is lighter and it is easy to move here and there whenever you want to do it, and also cheaper for sure. The best thing is, not fleas! I don’t really like metal dog house, because it seems to be cold and not comfortable for puppy. It’s little expensive if you compare it with other materials, but will last for a very long time. Most people measure dog house from their dog’s weight and it is quite accurate. But if you own a tall one, like Greyhounds, it would be best if you do height measurement as well. Actually, it’s best to measure weight, height, length, and width of the dog in order to get the perfect dog house size. The house should enable the dog to enter, turn around, or lying. The door should be at least 3/4 of your dog’s height. If his height is 32 inches, then the door should at least have 24 inches tall. The height of the ceiling should be 3-5 inches taller than your dog when he sits on the ground. As for the length, 6-8 inches longer than your dog’s length when laying (nose to rump) will be great. Some dog houses are equipped with temperature control feature. With this, you can control temperature inside the dog house, which is a great thing for dog. In summer, you can make the temperature lower and the opposite in winter. But, if your dog house doesn’t have this feature, then you can overcome it with the size and material of the dog house. A wooden dog house is warmer than other material, so your dog will feel comfortable in winter. Super big dog house also doesnn’t help in winter. Dogs usually prefer small but secure and warm dog house. It’s important to get the dog house that easy to built or set up. It’s not funny if you wrongly assemble and break some parts of it. Make sure it’s easy to use and your dog loves it. You don’t want to see that after you spend hours to assemble it and suddenly your dog doesn’t want to get inside, right? Now your dog has his home and he doesn’t make your house dirty anymore. That’s great news! The bad news is, you have to clean another house beside yours. It’s impossible to ask your dog to clean that up itself. So, let’s start to learn how to clean the dog house. First of all, get all the things out from the house. Mattress, blanket, toys, anything! Put blanket into washing machine and dry it in the sun. For toys, soak all of them into soapy water. You can deal with it later. Now, for the dog house, spray the house all over and apply disinfectant cleaner to your plastic brush. You maybe want to wear your rubber gloves, in case you are going to deal with feces and urine. Now, start brushing! Make sure you clean the outside too. To finish it, use your garden hard spray to rinse the house. Back to toys, scrub it one by one. Rinse it and add some water for second rinse. Use towel to help to drying it. If your dog is a large one, then its house must be a large one too. For them who have small houses, it can be a problem. Where are you going to put the dog house so it won’t take too much space? One of the solutions is to use table style dog house. This modern dog house can be used as table in the same time you use it as your dog house. The surface was designed so you can put anything above it. Simple, modern, and help you solve your interior problem.